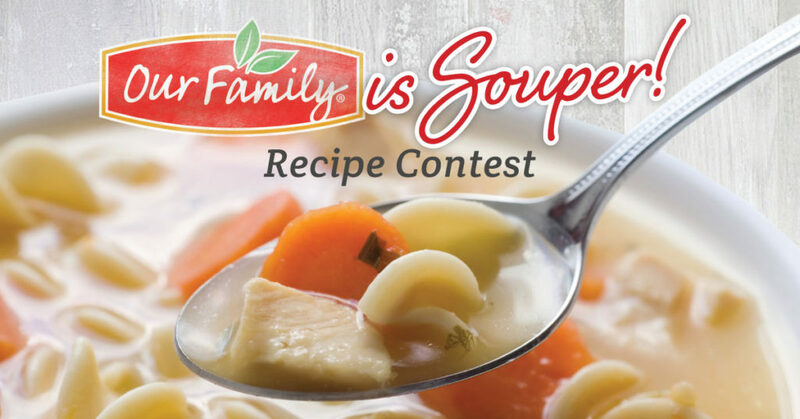 GRAND RAPIDS, Mich. – To celebrate the introduction of its Our Family® brand in the Michigan market, SpartanNash is asking cooks of all levels to send in their favorite soup recipe as part of the Our Family is Souper recipe contest. The grand prize winner of the Our Family is Souper recipe contest will receive $2,500 in free groceries, and the winning recipe will be featured on spartannash.com, ourfamilyfoods.com and Family Fare Supermarkets, D&W Fresh Market, Forest Hills Foods, ValuLand and VG’s websites. Meal collections with the recipe and ingredients will also be available through Fast Lane, SpartanNash’s seamless online grocery shopping experience. To enter the Our Family is Souper recipe contest, cooks of any skill level can submit their favorite soup recipe using a minimum of three Our Family products. Full contest rules and submission forms are available at ourfamilyfoods.com/soup-contest. Recipes must be submitted by 5 p.m. ET on Wednesday, Jan. 31 to be eligible. Nearly 2,000 Our Family products are available at SpartanNash’s 87 corporate-owned retail stores and more than 300 independent retail customers throughout Michigan, offering quality and value in every aisle. Ten semi-finalists in the Our Family is Souper recipe contest will be announced in February, and each will be paired with a food pantry in their local community during a public voting period. The top five finalists selected by popular vote will then have a judged tasting of their soup recipes, with the grand prize winner receiving $2,500 in free groceries and their pantry partner receiving $2,500 worth of Our Family products. The runner up will also receive $1,500 in free groceries, with their pantry partner receiving $1,500 in Our Family products. Prizes will be awarded to each of the finalists and their pantry partners. For more information, visit ourfamilyfoods.com/soup-contest.